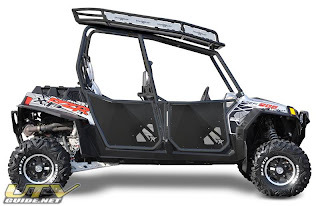 Be the first to have after-market accessories for your Polaris RZR XP 4! Blingstar is in full production of doors, front & rear bumpers, roof racks and more for the all new RZR XP 4. The Gladiator is made from 6061 aluminum with 1 & 3/8″ tubing. This UTV bumper is light weight, supports a wench and features an interchangeable face plate and a Blingstar riveted name plate. Available in Polished, Textured Black.